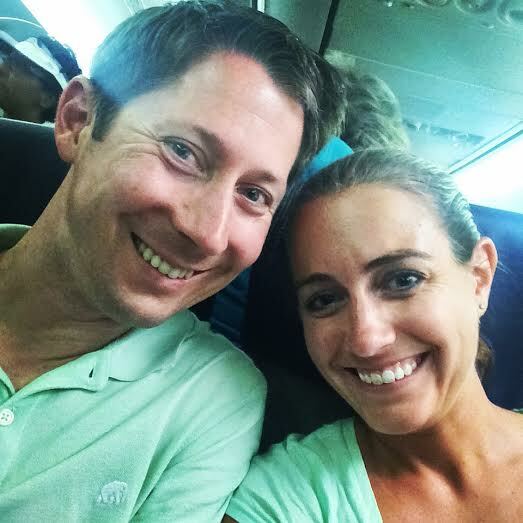 I know you all have been waiting for it – the last and final part of our Florida vacation recap! If you missed part 1 (our time in Cocoa Beach) or part 2 (our three full days at Disney World), be sure to check them out! Our last two days of vacation were jam packed and full of exciting activities! We kicked off Thursday by going to Epoct at park opening so that we could get on line for Test Track right away. We pulled into the parking lot about 20 minutes before the park opened, and for the first time ever Preston and I both got to hear the Epcot opening music. It was very exciting to see confetti fly into the air and hear the park opening music. Even though we made a beeline for Test Track immediately once the park opened, we still stood in line for almost 30 minutes! After riding Test Track, we also rode Mission Space and Spaceship Earth before heading back to the car. We had a baseball game to get to! 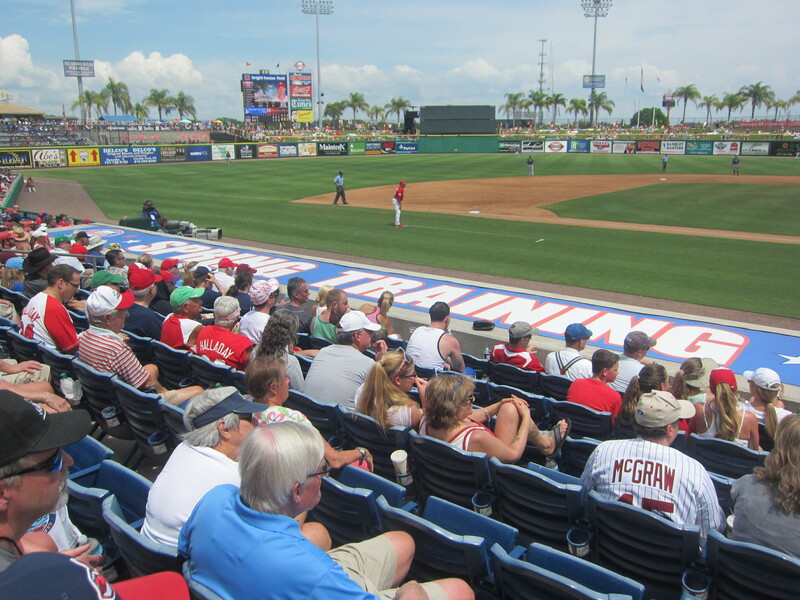 It took about 90 minutes to drive from Epcot to Bright House Field in Clearwater, which is the Spring Training home for the Phillies. 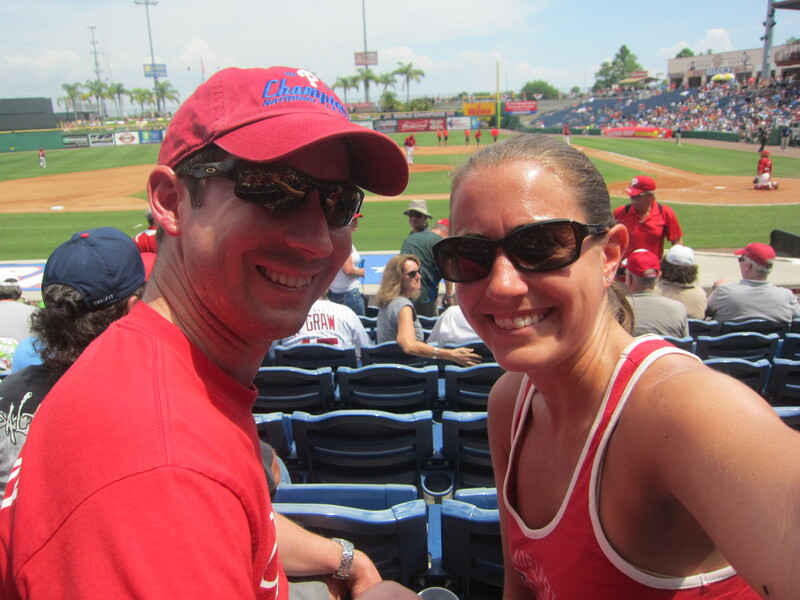 Even though the Phillies lost 10-1 to the Rays, we still enjoyed our afternoon at the ballpark. 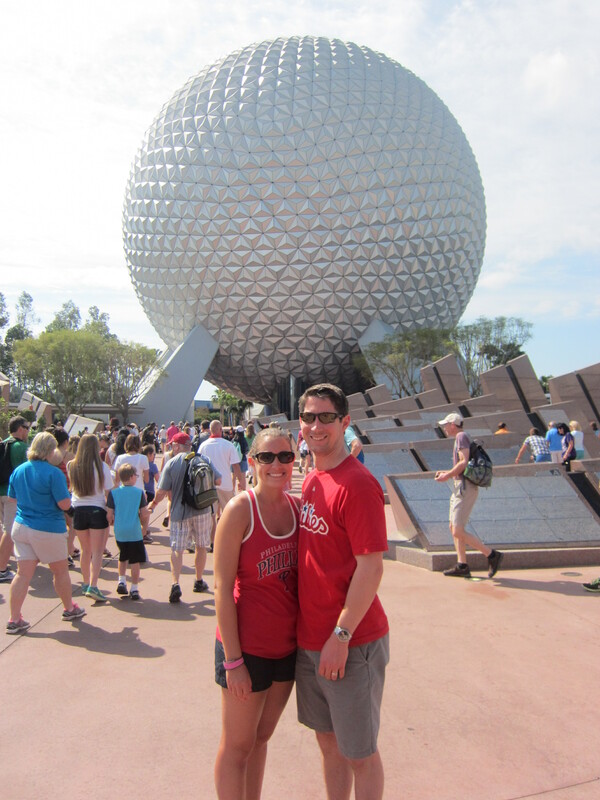 After the baseball game, we drove back to our hotel in Lake Buena Vista to shower and change for our evening at Epcot. 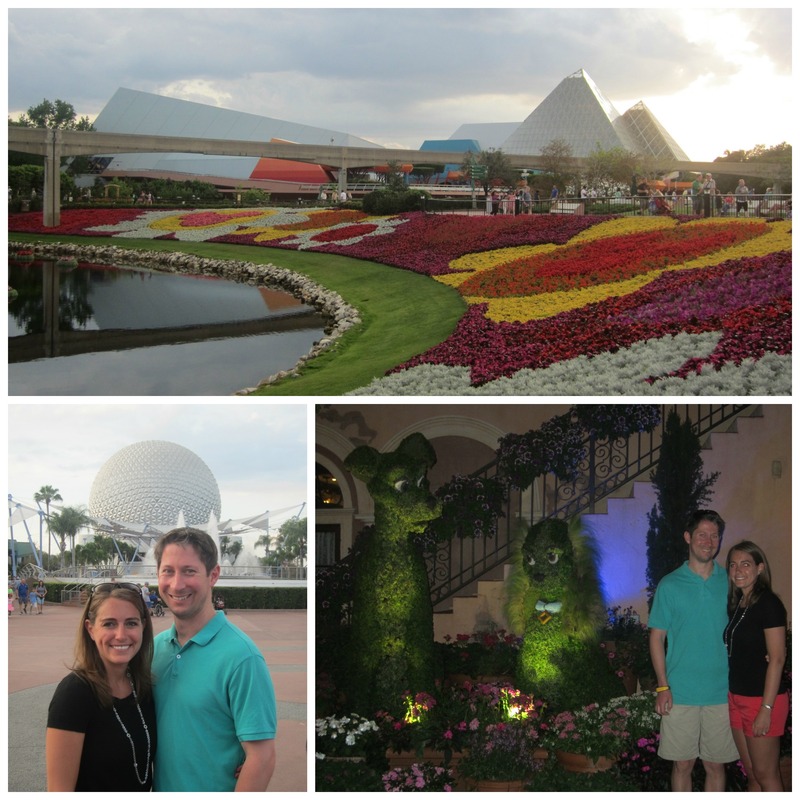 Once we arrived back at Epcot we used our Soarin’ Fast Pass, and also enjoyed walking around seeing the topiaries again that were up as part of the Flower and Garden Festival. Dinner that evening was at Via Napoli in Italy, where we enjoyed one of the best pizzas that I’ve ever had! Neither Preston nor I had eaten at Via Napoli before, but we both agreed that we will be making a return trip to this restaurant in the future. After dinner we headed back to our hotel since we wanted to get a good night’s sleep before our last day at Disney and in Florida. We spent Friday at Magic Kingdom, where we spent the day riding some of our favorite rides, including Buzz Lightyear, Jungle Cruise, and Splash Mountain. 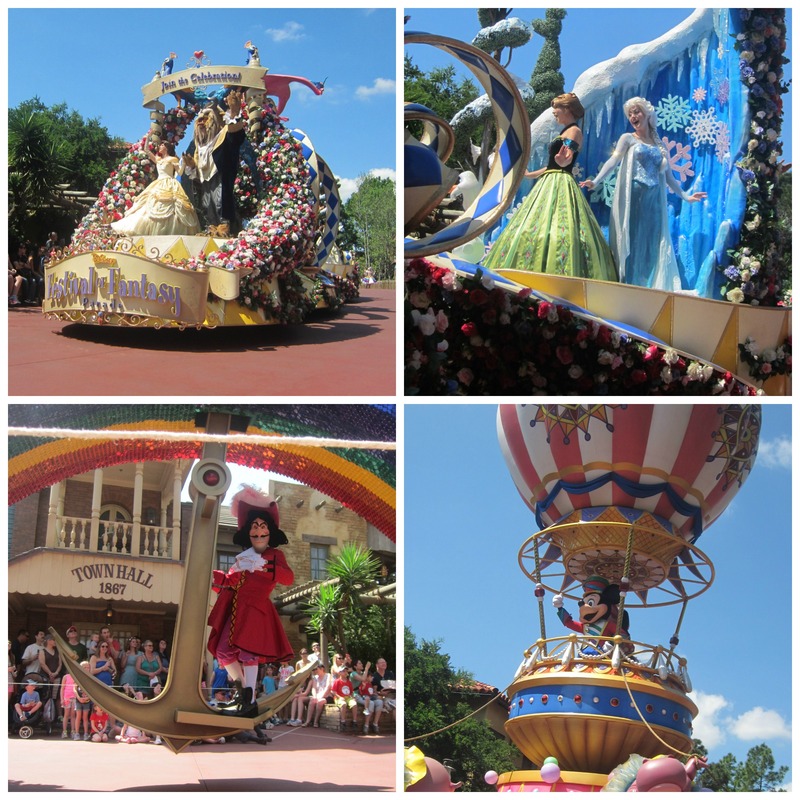 We also saw the new Festival of Fantasy Parade, which I thoroughly enjoyed. 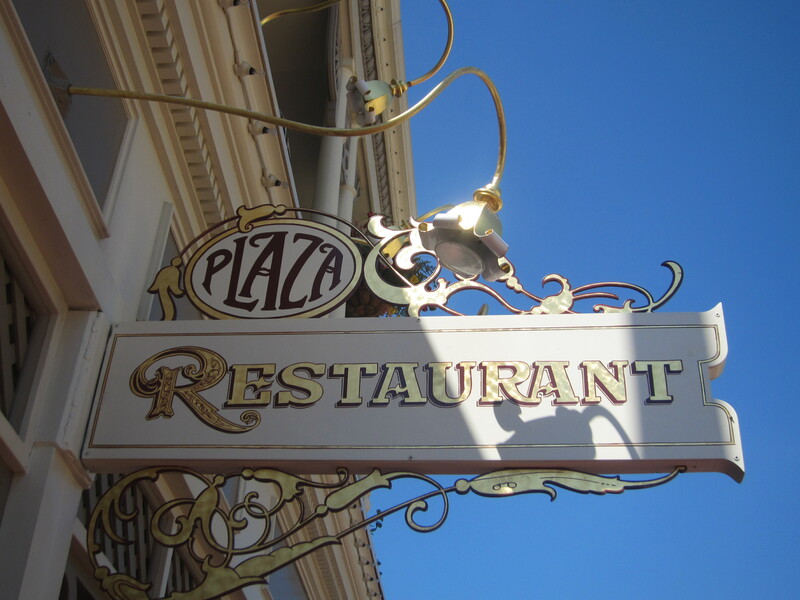 For lunch, we ate at another new to me restaurant: The Plaza Restaurant. Since it was Good Friday, I opted for the Tuna Salad sandwich, which was super delicious! Around 3:15 pm, we said goodbye to Magic Kingdom and drove to Downtown Disney. We had a reservation for an early dinner at Splitsville, another new to us restaurant. 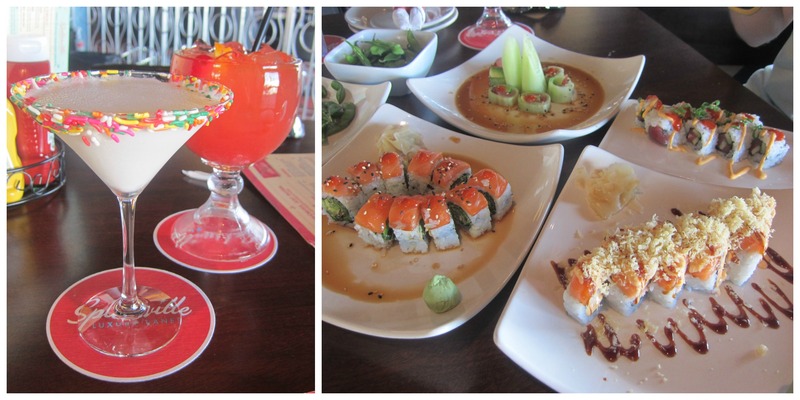 We thoroughly enjoyed our sushi dinner, as well as the tasty adult beverages. After dinner, we thought we had some time to kill, so we walked around Downtown Disney for awhile. What we didn’t realize was that the parking lot had become a madhouse while we had eaten dinner, and by the time we walked back to our car and fought traffic for over half an hour in order to get out of Downtown Disney, I started to panic that we would miss our flight home. We made it back to the airport with minutes to spare, and thankfully there wasn’t a line to check our suitcases or to get through security. We had a great week in Florida, and were sad to see our vacation come to an end. 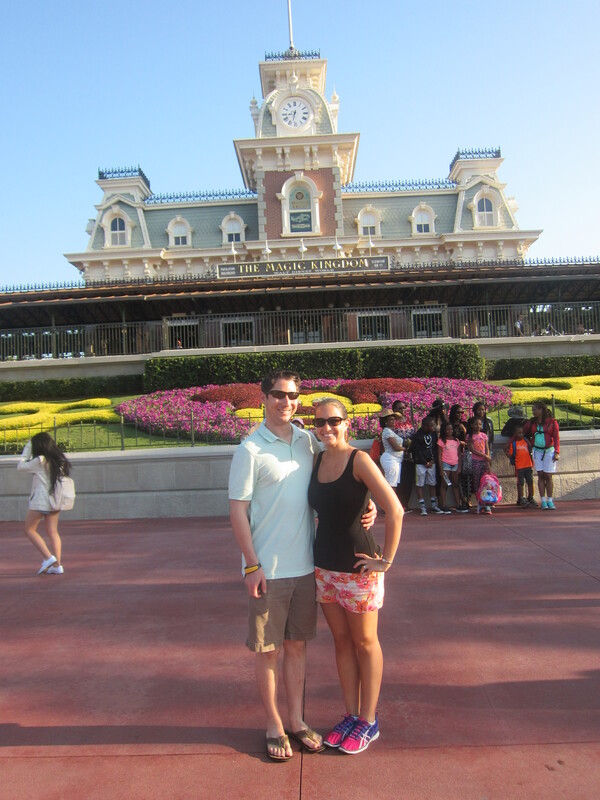 But if you know us well, you know we’ll be headed back to Disney World sooner than later for another vacation! QOTD: Where is your favorite place to vacation? This entry was posted in Miscellaneous and tagged Disney World, Flower and Garden Festival, Splitsville, vacation, Via Napoli. Bookmark the permalink. Sounds like you had a great vacation! Disney is my favorite place to go. 🙂 I’m glad you got to experience Via Napoli’s delicious pizza! I try to go there every Disney trip. Thanks Britney! We can’t wait to plan a return trip to Via Napoli! Looks like you two had an amazing time!!! I’ve never eaten at Via Napoli but I did try the new Italian restaurant at the Boardwalk last month. I forget the name but it was good food. Glad you enjoyed it! We haven’t eaten there yet. I would love to travel to down under some day! That drink with the sprinkles looks so cool! 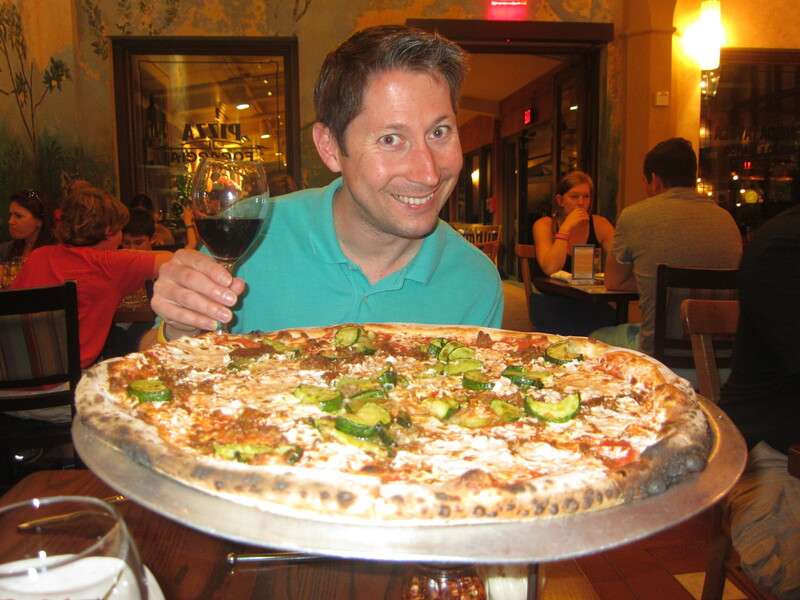 And I loved the pizza at Via Napoli too. I’m hoping to see the Festival of Fantasy parade for the first time during our November trip to Disney World. You definitely should! It was such a fun parade to watch. i love Disney, although my favorite place to vacation is Bar Harbor, Maine. Sounds like you has a fantastic trip. Never been to Maine before. Hoping to change that sometime soon. What an action packed final two days. My favorite place to vacation is probably anywhere in Europe, and if French Polynesia was closer I would love to go there every year. It is so stunningly beautiful! Its looks gorgeous from all of the pictures that I’ve seen. You guys are living the life and it looks like you had a load of fun! Now you are making me go ahead and schedule my vacation. That a great vacation! Looks like yall do exactly like we do, go from can to can’t. We pack as much as we can in the few days we have. I’ve been blessed to be able to go to Disney once a year at Thanksgiving! Our 5th time coming up and last year was the very first time I had been to downtown Disney. What a treat I loved it. I also love test track and I’m going to remember the restaurant in Italy for us to try that pizza looks amazing! Hope your family enjoys Via Napoli as much as we did. So fun! I’m getting the Disney bug. I want to go back! One of my favorite places to vacation is Costa Rica! Costa Rica is on our bucket list. Now that is a pizza:) AWESOME! What a fun trip, you guys look and sound like you had a blast! I miss Disney! The last time I went was in college. I used to go every year as a kid. I can’t wait to start taking my kids! Your kids will love it, Sue! Looks like so much fun! Is it bad I’ve never been to Epcot? You definitely need to change that soon! Its a great park, especially for adults. Sounds like you had so much fun! I haven’t been to Disney in so long and looking at your pictures makes me want to go soon! Test Track is probably one of my favorite rides – at least top 5. And how fun that you got to hear the opening music!! Test Track is definitely a fun ride! Sounds like so much fun! We love Disney World too and the next time we return will be to take our granddaughter (she’s now 3) and we have plans to take her when she turns 5 or 6. Currently our favorite place to vacation is Roatan, Honduras. We love to snorkel and went there for the 1st time in 2014 and have already booked our trip back for 2015. Two of my friends have been to Honduras and they absolutely loved it there! When my boys were little we used to go to spring training games. So fun! Spring training is definitely a fun experience! Looks like an amazing Vacay!! 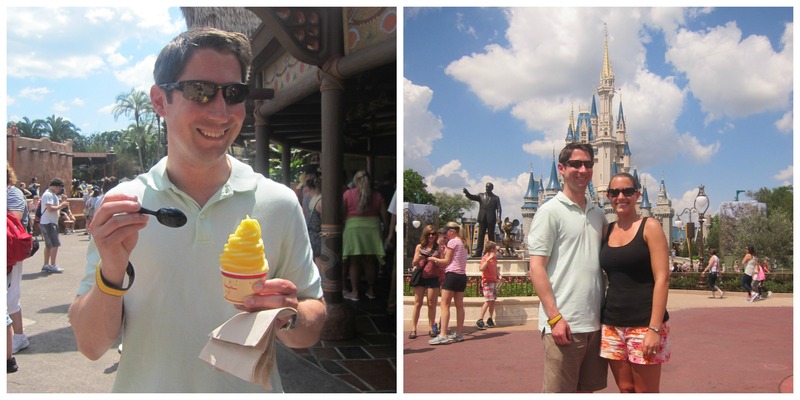 I love Disney and it looks like you made the most of it! We definitely packed a lot into the time that we got to spend there. Looks like you had a blast! I love disney! I was just there a couple months ago for a blogging convention. We had media fast passes so we were fortunate enough to hit every park in 1 day and ride all the rides we wanted to. I’m glad we had the passes because when we went to Epcot another day to eat and drink our way around the world it ended up raining from 9-5 not fun! I had the sushi at splitsville before too and it’s great! I was surprised at what a wide variety of food they offered. I’m glad you had a blast and were able to go during some of the cooler months. Stay away in July and August at all costs. I only live an hour and a half away and made the mistake of going with my mom one year for her birthday in July. It was miserable. Covered in sweat from head to toe. Enough with my ramblings. Have a great day! Fast passes are definitely a saving grace, especially for the popular rides. Its definitely hard to not have fun there. you had my favorite drink at splitsville! We loved our trip there this time! My word, I just want to jump into that pizza and eat my way out! Favorite place to vacation was definitely France. I feel like I barely saw any of it but I fell in love. France is on my travel bucket list. Its definitely a different experience as an adult than as a child.